It’s no secret that social networks are among the most widely adopted technologies of our times. Almost 40 per cent of the world’s population now uses social media and the figures only keep growing. Yet it seems that there is a gap between science and technology when it comes to the use of social media in scientific communities. 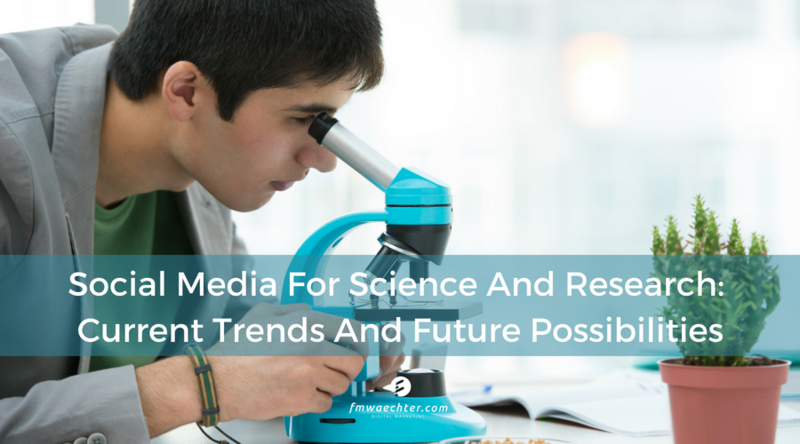 In this post we explore the advantages of using social media for science, as a scientist and the possibilities that these technologies offer to both science and society. Rates of social media use in the scientific community are low when compared to the general public or even to other professional groups. The traditional nature of scientific communication is unidirectional (think about conferences or articles in peer-reviewed journals), but this long-form narrative contrasts with the current evolution of communicative preferences across the globe. Nowadays, two-way interactive exchanges find in social media platforms the ideal space for conversations between people from a wide variety of backgrounds. Scientists and researchers usually prefer to use professional networks with a clear scientific or academic focus. This is the case of Researchgate, Labs Explorer, Academia, or Mendeley, which are considered the best scientific social networks. But this begs the question of whether platforms like Facebook, Twitter, or LinkedIn are being unfairly overlooked and could in fact contribute something to scientific research. The truth is that there is a reluctance when it comes to using social media as a scientist. A 2014 survey revealed that a large amount of US-based scientists will never consider using Twitter or Facebook for academic or professional work. The problem seems to stem from issues of reputation and credibility, hence the preference for more exclusive or professional networks like the ones mentioned in the previous paragraph. Within the scientific community, social media networks are generally perceived as not suited for “high-quality” science given the amount of banal or irrelevant content that is available on them. Credibility issues stem from the fact that very few authoritative voices are present on these platforms, but at the same time this can be an opportunity for scientiststo fill the void. The “Big 3” (Facebook, Twitter, and LinkedIn) have the potential to be the best scientific social networks if they are used to promote research interests expertly. A 2018 study showed that some science-related pages and Facebook profiles have a follower base in the tens of millions. The fact that they can reach such wide and non-specialised audience means there is potential for scientists to see this platform as a space where to create online communities that have common interests. Facebook’s social nature makes it easy to find audiences with similar concerns or likely to collaborate in projects ranging from research sponsorship to events funding. On this note, a study of the engagement levels generated by science-related Facebook pages showed that the highest engagement was achieved by posts related to research funding, and a US study confirmed that many scientists think that having a social media presence can help them demonstrate relevance to funding agencies. LinkedIn has a wider acceptance among scientists perhaps due to the idea that this network as a high-profile platform with a predominantly professional focus. But this platform offers more than the option to create an online profile, and it can become the virtual equivalent of a lab meeting or a discussion between like-minded professionals. Twitter is often used to interact with fellow scientists, tweet about research or link to relevant articles. Some studies have shown that academic tweets lead to increased citations and paper downloads, so this platform can be an alternative way of establishing a presence within the scientific community. It is also worth noting that only 5 per cent of Twitter interactions involve organisations and the media, so there is potential for exposure when organising events or drawing attention to scientific activities that require funding. There are two Twitter features that are specifically useful in the scientific arena: conference hashtags have proven particularly powerful, and lists can help create online communities of individuals with common interests and goals. What’s more, Twitter can indeed be used to support the scientific process by providing raw data that has immense value in and of itself from a sociological point of view. Researchers, scientists, and conference organisers can gain extremely valuable insights into how social media users react and interact with news and announcements, and these findings can be then used to discern patterns and modify online strategies to reach an even wider audience in terms that make sense to them. To recap, social media can become a productive communication channel for researchers to find funding, for conference organisers to attract delegates and sponsors, and for scientists to raise awareness about their work. All these platforms can be used to cultivate stronger links with colleagues all over the world and to raise awareness about current research on social issues. To make the best use of social media, it’s important to keep two things in mind: focus on the audience and focus on purpose. The quality of social media content and interactions is not an inherent characteristic of the platform itself, but rather depends on how they are used. And only good things can happen when they are used for purposes like outreach, communication, and collaboration. Social media networks can help spread scientific knowledge. Sharing is the very nature of these platforms, so they can help bring down barriers to the dissemination of scientific information and foster a culture of science communication between different stakeholders. They can also help make research and scientific contributions more widely available. Traditionally, scientific communities have been “gated”, but social media can contribute to the democratisation of scientific discourse and make it available to more people. As a side effect, this can generate curiosity and / or a deeper appreciation for the contributions that science has made and can made to society at large. Last but not least, science itself can have a stronger online profile thanks to social networks. This can add credibility to the wealth of information generated in the public sphere, counter the effects of fake news or unproven claims with solid scientific research, and generate public debate about issues that are of paramount importance for society as a whole. This is already happening in areas like food security and environmental science. To summarise what we have discussed so far, one of the key roles of science is to research social issues and find transformative solutions to questions that concern us all, and social media platforms are just another medium to promote scientific activity and make it more accessible. The channel is there, so all that remains is for scientific communities to make the best possible use of the tools available to promote their research interests and extend the benefits of science to the general public.